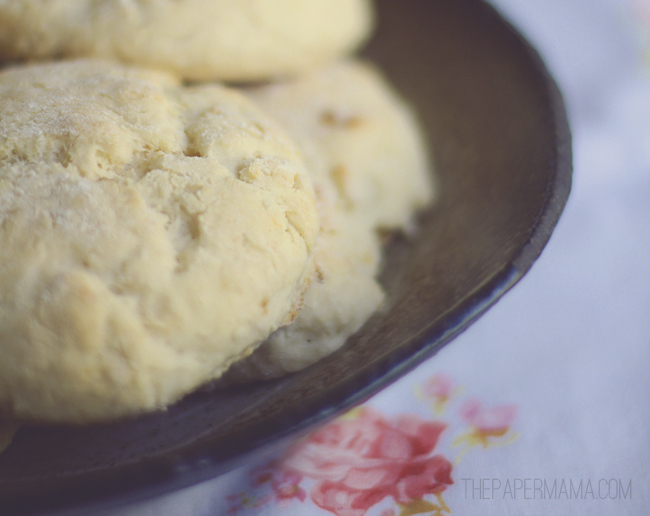 The Best Buttermilk Biscuits Recipe. Ever. The best biscuits ever. Yup! That’s right. Ok, well… I’m sure there are some pretty amazing biscuits out there that I haven’t been lucky enough to taste, yet. But, for a quick homemade recipe…. this is the best. Yup. In my opinion. I’ve made many many many many biscuits in my life. I feel like it may have been the first thing I ever baked. As a kiddo, this was my favorite thing to have with breakfast (well, and bacon too), and it still sort of is a favorite breakfast item of mine. Most nights my husband makes dinner, because he actually likes to (I know, weird). Though, there are some nights I need to cook dinner. SO, that usually means: biscuits, eggs, and hash browns. I know. I’m lazy. Ha! I just don’t enjoy cooking. Baking I enjoy. Cooking: Meh. Seriously. I’d rather clean the bathroom than cook a meal (unless I’m making some fried chicken… I might do anything for fried chicken). Preheat your oven to 450°F. Combine all the dry ingredients in a bowl. Cut in the vegetable oil until it’s a fine course meal texture. Add the buttermilk and blend it just until it’s combined (over blending makes hard biscuits). The mixture should be very wet, add more buttermilk if it’s too dry. Turn the dough onto a floured surface. Gently pat the dough (do not roll) until it is about 1″ thick. Use something round to cut out the biscuits. 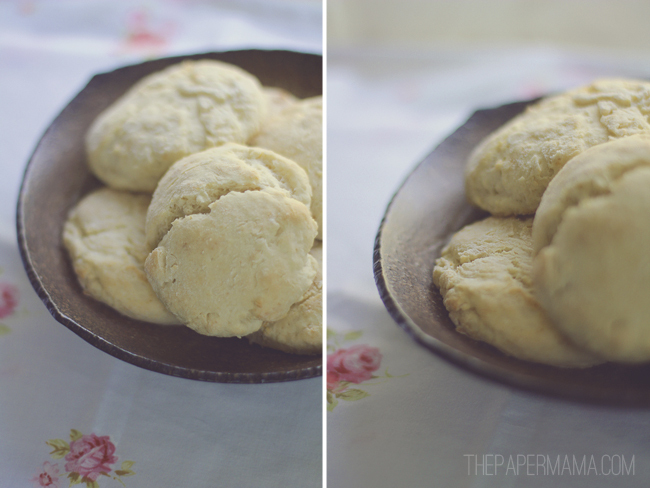 If you have scraps, you can combine them together to make a biscuit. 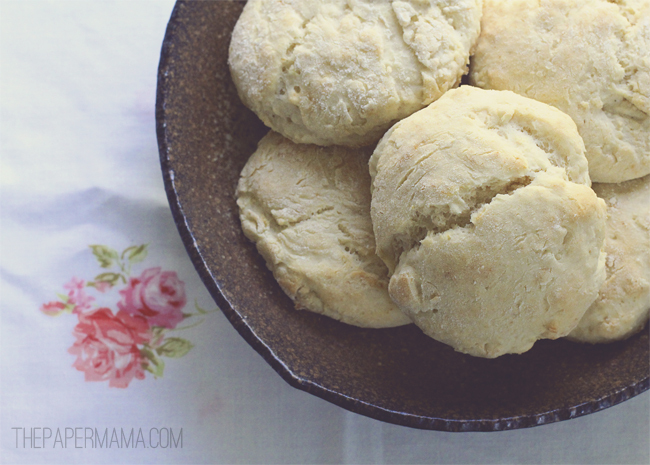 Bake for 10 – 12 minutes (just until the biscuits are lightly browned). 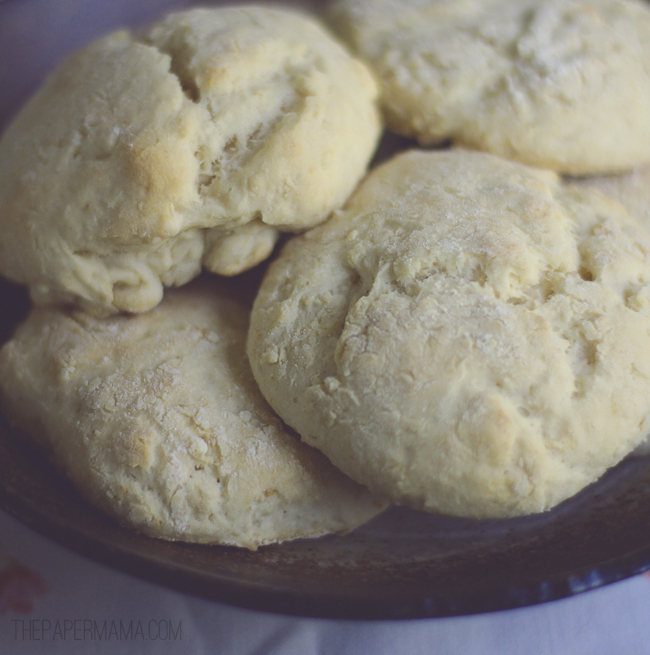 The original recipe for these biscuits says it yields 10 biscuits… but, the most I ever get from this recipe is 6. So if you want more, just double the recipe. AND, enjoy! Yum yum yum. yummy!! i will have to try this recipe SOON!!! i loooooooooove biscuits. i'm from germany and not usually very impressed with american baked goods but southern freshly home made biscuits are heaven! this is pretty much how i make them (just that i make a bigger batch cause i'm not the only biscuit lover in this family). lately i've been using whole wheat pastry flour or white whole wheat flour so that i can cheat myself into believing that they're not poor evil. works pretty well and they're still delicious especially if you use real butter. have you heard of the trick to put them all really closely together on the baking sheet? that's what's made all the difference for me in getting them to rise beautifully. there, i'm a dork! I'm going to have to do that next time! I can eat biscuits all day, every day!